Publishers are starting to reveal fall titles, and fall is looking good! Scientists agree that the people of the world began in one region and slowly scattered across the globe. But there is very little agreement how the scattering occurred. Just a lot of theories and speculation. After spending a year living among the Polynesians on Fatu Hiva, Thor Heyerdahl speculated that Polynesians crossed the vast Pacific on rafts from Peru. The folk stories and similar names were enough to make him wonder. Of course, few people believed such a journey was even possible. Heyerdahl and his crew proved it was possible. They lashed together balsa wood with hemp rope and fashioned a single mast and a bamboo cabin. Navigation was by sextant, and much of their food was from the sea. Rogue waves and a storm were nearly enough to cause them to issue a distress call from their radio, but they stuck with it and reached Polynesia. No one will ever know for sure that ancient people made this voyage, but Heyerdahl proved it could have happened. 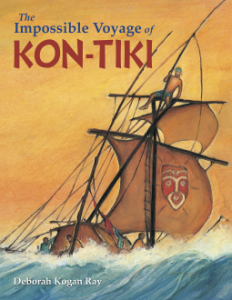 The story so fascinates readers that Heyerdahl’s original account of the voyage was translated into seventy languages and is still in print sixty years later. Ray’s beautiful illustrations give the reader the feeling of being there for the voyage and encourage the desire to travel to the places mentioned. Second graders will learn about anthropology, Polynesia, and rugged travel. They will also get a chance to hone literacy skills and learn that the seemingly impossible may not be. Natural processes never exist in isolation from all the other natural forces around them. In this fun and interesting nonfiction picture book, the authors take an inventive approach to pointing out why this is true. 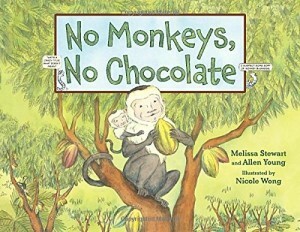 If it weren’t for monkeys, we wouldn’t have chocolate bars. Actually, if it weren’t for midges, maggots, lizards, and fungus, we wouldn’t have chocolate either. The story of cocoa production is slowly worked through from the beans to the pods to the roots to the monkeys that help plant new seeds. The tiny bookworms in the corner of each two-page spread add the touch of humor that will ensure holding the attention of kids. The illustrations are realistic and colorful. 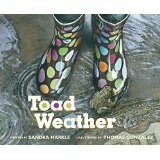 This is a perfect beginning reference for second graders learning about nature and science. It will hopefully promote further study. The reading level will be a bit challenging but should enhance literacy skills and comprehension. The suggestions for what kids can do next includes many easy tips. Most mammals are beautiful and amazing. This book tends to reinforce that view. Detailed and realistic illustrations of many mammals are highlighted by simple text in the main section of this wonderful book. 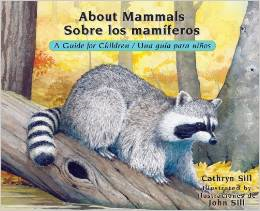 The author shows a wide range of mammals and habitats while still letting the reader know what makes a mammal a mammal. From bats to porcupines to whales, they’re all here. And they all have hair and drink milk from their mothers. Corresponding to each illustration plate is much more advanced information in the afterword. 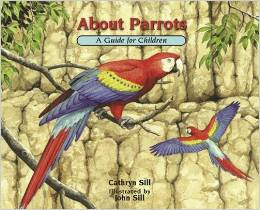 This section offers background information for teachers, librarians and parents to use when sharing this book with children. There is also a list of books for further reading and some current websites for use in further research. This volume is a new addition to the “About…” series from the Sills. Each of these books could be used to fulfill core curriculum standards in the area of science and nature. They would give children enough information and interest in the subject to continue to study mammals. Also, this is a bilingual version, giving access to more children and affords opportunities to learn more about another language. 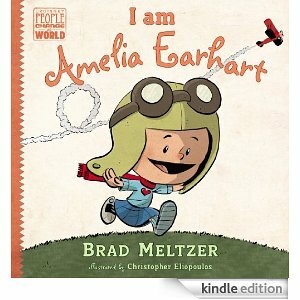 An excellent addition to the series “Ordinary People Change the World” is this new biography about Amelia Earhart. Written in the first person, it is like a comfortable conversation between two kids. It is exciting to read about Amelia’s early experiments with ramps and roller coaster carts in her grandmother’s back yard. She tells about her first ride aboard an airplane at a county fair which is something many young readers will have seen or experienced. She talks about all the different jobs she had to do while trying to raise enough money for her flight lessons. The illustrations are great fun as we see the small cartoon version of Amelia driving a huge truck, taking stenography notes and posing as a photographer. The text is sparse and accessible for beginning readers. It will invite them in and encourage them to keep reading this book as well as many others in the set. Her recollection about the flight lessons is valuable as she tells her readers that she never was the best or fastest. Instead she was the one who worked longest and hardest at her lessons. This is an excellent inspirational book for all young readers, but especially for young girls who might think their options are limited. Core curriculum standards in the area of history, biography and literacy can be practiced and strengthened with this book. Readers will love being able to see real photographs of Amelia at the end of the book. It adds realism to the biography experience and shows what the early airplanes looked like. These photographs may provide a springboard for further research and perhaps even career dreams. Children love zoos and wondering how they got started is sure to amaze young readers. Not surprisingly, it became the sport of the very rich and powerful. Kathleen Krull has done her research. The scant text tells of zoos from 4,400 years ago, in what is now Iraq to one 3,000 years ago in China, and one in 2009 in San Diego, California. Many others in between are included. She clearly explains that while zoos used to be mainly for showing off wealth or power, they are now used to protect animals. They are no longer placed in cages, but specific habitats are built to resemble their natural environments as much as possible. Large colorful, watercolor illustrations enhance this brief history and development of zoos in the world. Children will be able to recognize the animals, parts of the world and approximate times in history from these carefully prepared images. Teachers and librarians will be able to fulfill educational standards in the areas of science, history, literacy, geography, cultures, and art using this one text. 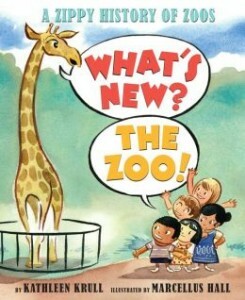 After reading this book, children will be ready and anxious to visit the zoo either online or in person. The list of sources in the back of the book provides many great zoo sites to visit. 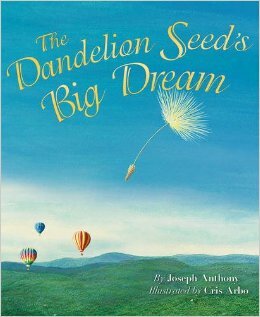 If used as a classroom read aloud, there are many opportunities for discussion and comprehension: Why are some plants considered flowers while others are called weeds? How does littering interfere with nature? Themes of courage, patience, and perseverance will allow second and third graders to make connections to their own lives. Back pages include a diagram of a dandelion and its different life stages, as well as related DIY activities to do with children. 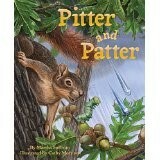 More classroom resources can be found on the publishers website: www.dawnpub.com. What are forests and why are they important? What kind of wildlife lives in a forest? These questions and more are answered in the latest offering from the About Habitats series. Cathryn and John Sill have created a wonderful beginner’s guide, presented in a clean, organized fashion. On the left-hand side of the page spread, a simple sentence with easy language appears over a white background. To the right, readers are treated to a painting, vivid with color and detail. With clear labeling for easy cross-reference, different levels of information are available for different reader levels. A kindergartener may pore over the picture of the cute chipmunk, while a second or third grader can expand their knowledge and literacy skills from the plant and animal identifiers (e.g., an Eastern Chipmunk in a deciduous forest, surrounded by morel mushrooms and Christmas ferns). Young readers will learn about the different types of forests like deciduous, tropical, or boreal and how each has their own distinct characteristics. 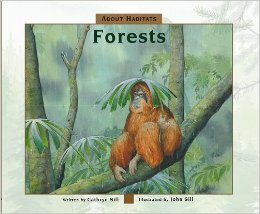 The illustrations show animals and plants thriving within each habitat: a snowshoe hare blends into the snowy landscape of the boreal forest; an orangutan finds shelter in the tropical forest canopy; a black bear, broad-winged hawk, and box turtle live side by side in the deciduous forest. Extras include a global map of the major forest areas of the world, a glossary, bibliography, and additional websites for further information. 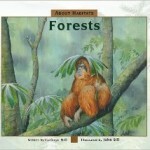 For more titles in the About Habitats series, visit the publishers website: www.peachtree-online.com.